SPOTLIGHT ON GOSPEL GROUPS PART EIGHT! Above: Photo of Golden Gate Jubilee Quartet. 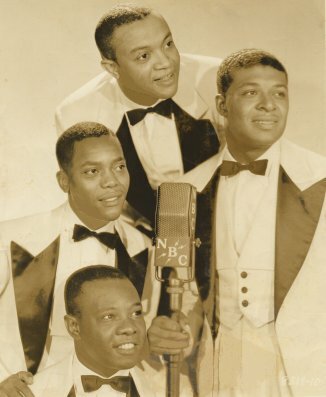 (Top L-R) Orlandus Wilson, Willie Johnson, William Langford, (Bottom) Henry Owens. This is the radio and recording group from 1936 to 1940. From George Moonoogian: "Although they formed in high school in 1934, they really didn't become popular until 1937 when they sang on "The Magic Key Hour" for NBC, over station WBT in Charlotte, N.C. They recorded 14 sides for Bluebird on 8/4/37 in the ballroom of the Charlotte Hotel. Bluebird was going to name them The Four Chocolate Bars on wax, but thought better of it, and they were billed as The Golden Gate Jubilee Quartet!" For an article about Golden Gate Quartet at American Music Archives, please click HERE. Above: Collage of Bluebird Record Labels, all recorded by Golden Gate Jubilee Quartet at the Charlotte Hotel on 8/4/37, their very first session. A) Click on an option below to listen to Golden Gate Jubilee Quartet using Streaming RealAudio. B) Click on an option below to listen to Golden Gate Jubilee Quartet usingDownloading RealAudio. A special "Thank You!" to Paul Ressler and George Moonoogian for their input to this week's presentation and also for their many previous contributions!